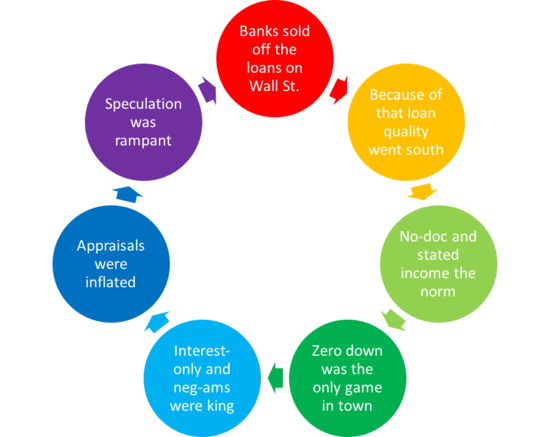 What Caused the Mortgage Crisis? So, “what caused the mortgage crisis” anyway? In case you haven’t heard, we went through one of the worst housing busts in our lifetimes, if not ever. And though that much is clear, the reason behind it is much less so. There has been a lot of finger pointing. In reality, there wasn’t just one cause, but rather a combination of forces behind the housing crisis. I’ll attempt to list as many as I can think of here. In the old days, banks used to make mortgages in-house and keep them on their books. Because they held onto the loans they made, stringent underwriting guidelines were put in place to ensure quality loans were made. After all, if something went wrong with the loans, they’d be accountable. And they’d lose lots of money. Recently, a new phenomenon came along where banks and mortgage lenders would originate home loans and quickly resell them to investors in the form of mortgage-backed securities (MBS) on the secondary market (Wall Street). This method, known as the “originate to distribute model,” allowed banks and lenders to pass the risk onto investors, and thereby loosen guidelines. The result was casual underwriting, less oversight, and more aggressive financing, which ultimately led to a lot of bad loans being made. Banks and lenders also relied on distribution channels outside their own roof, via mortgage brokers and correspondents. They incentivized bulk originating, pushing those who worked for them to close as many loans as possible, while forgetting about quality standards that ensured loans would actually be repaid. Of course, banks and lenders modeled their loan programs on what Fannie and Freddie were buying, so one could also argue that these two “government-sponsored enterprises” also did their fair share of harm. In short, if the loan conformed to the high standards of Fannie and Freddie, it’d be easier to sell on the secondary market. And it has been alleged that the pair eased guidelines to stay relevant in the mortgage market, largely because they were publicly traded companies steadily losing market share to private-label securitizers. At the same time, they also had lofty affordable housing goals, and were instructed to provide financing to more and more low- and moderate-income borrowers over time, which clearly came with more risk. However, the private mortgage market took control during the lead up to the eventual crisis thanks to their bevy of high-risk mortgage products, so Fannie and Freddie had to ease their own guidelines to maintain market share. As a result, bad loans appeared as higher-quality loans because they conformed to Fannie and Freddie. And this is why quasi-public companies are bad news folks. That brings us to bad underwriting. Now it wasn’t that underwriters didn’t know what they were doing, it was more a matter of influence from upstairs. They were often told to make loans work, even if they seemed a bit dodgy at best. Again, the incentive to approve the loan was much, much greater than declining it. And if it wasn’t approved at one shop, another would be glad to come along and take the business. After all, the loans weren’t being held for more than a month or so before they were the investors’ responsibility. So you could get away with it. Going hand-in-hand with bad underwriting was faulty appraising, often by unscrupulous home appraisers who had the same incentive as lenders and originators to make sure the loans closed. If the value wasn’t there, it only took a little bit of tinkering to find the right sales comparables to get it right. If one appraiser didn’t like the value, you could always get a second opinion somewhere else or have them take another look. Home prices were on the up and up, so a stretch in value could be concealed after a few months of appreciation anyway. And don’t forget, appraisers who found the right value every time were ensured of another deal, while those who couldn’t, or wouldn’t make it happen, were passed up on that next one. Another big issue was the lack of a down payment in the most recent boom. Back when, it was common to put down 20 percent when you purchased a home. In the last few years, it was increasingly common to put down five percent or even nothing. In fact, zero down home loan financing was all the rage because banks and borrowers could rely on home price appreciation to keep the notion of a home as an investment viable. However, it wasn’t long before prices began to peak and eventually fall, causing all types of problems for borrowers with little or no equity in their homes. Those who purchased with zero down simply chose to walk away, as they really had no skin in the game, nothing to keep them there. Sure, they’ll get a big ding on their credit report, but it beats losing a whole lot of money. Conversely, those with equity would certainly put up more of a fight to keep their home. Playing off the lack of a down payment, aggressive loan programs like the pay option arm and other interest-only options also contributed to the mortgage mess. As home prices marched higher and higher, lenders and home builders had to come up with more creative financing options to bring in buyers. Because home prices weren’t going to come down, they had to make things more affordable. One method was lowering monthly mortgage payments, either with interest-only payments or negative amortization programs where borrowers actually paid less than the note rate on the loan. Some banks, like now-defunct Bear Stearns, actually offered a pay option arm at 100% LTV, meaning you could come in with zero down and make a super low payment, often as low as one percent, for several years before the loan adjusted to a more realistic rate. This of course resulted in scores of underwater borrowers who now owe more on their mortgages than their current property values. As such, there is little to any incentive to stay in the home, so borrowers are increasingly defaulting on their loans or walking away. Some by choice, and others because they could never afford the true terms of the loan, only the introductory teaser rates that were offered to get them in the door. It was so bad that some homeowners never ever made their first mortgage payment. Where all you needed was a credit score to get approved! Home loans used to be underwritten full doc, meaning you would need to provide pay stubs or W-2’s, along with asset and employment information. This would give the bank or lender plenty of reliable information to make an underwriting decision. Then came limited documentation loans, such as stated loans, now known as “liar’s loans,” which were intended for people like doctors and the self-employed who had complicated tax structures. Eventually, everyone seemed to be taking advantage of limited documentation underwriting, often because they couldn’t meet guidelines legitimately. After all, your interest rate would only be another quarter-percent higher in many cases, so why provide real income if you can fudge the numbers a little and get approved? More troubling were no-doc loans, where borrowers only provided a credit score. No income, asset, or employment information was provided, allowing virtually anyone with a decent credit history to get their hands on a new home. That brings us to the now infamous credit score, which became the bank’s go-to risk indicator in recent history. Instead of reading between the lines, lenders were happy enough to look at an automatically populated three-digit credit score to determine risk. If the applicant’s credit score was above a certain threshold, they were approved. Meanwhile, those with lower credit scores and perhaps more compelling borrower attributes would be denied. This led to a lot of first-time homebuyers getting their hands on shiny new houses, even if their largest loan prior had been something as simple as a revolving credit card. And then there’s super low interest rates, which have been historically low for years now, and have just recently hit their lowest point ever. During the boom, these low mortgage rates encouraged people to buy homes and serially refinance, with many taking large amounts of cash-out in the process, often every six months as home prices surged higher. Many of these borrowers had built up equity in their homes, but after pulling it out to pay everyday expenses, had little left and nowhere to turn when financing dried up. At the same time, those who pulled cash out did so using appraised values that can no longer be supported. So many of these borrowers now have loan amounts that far exceed the true value of their homes, and a larger monthly mortgage payment to boot. It’s not just families who have lost their homes. Tons of real estate investors have also defaulted on their properties, adding to the foreclosure epidemic and pushing home prices lower. Many of these speculators purchased handfuls of properties with little to no money down. Yes, there was a time when you could purchase four-unit non-owner occupied properties with no money down and no documentation! Amazing isn’t it? Why lenders ever thought that was a good idea is beyond me, but it happened. Of course, the minute home prices turned, most got out of the game, either by selling or simply walking away, creating a further drag on home prices. Everywhere you look, at least if you live in places like California, there are scores of new, sprawling housing developments. It seems every corner has a sign spinner or a billboard advertising new luxury condos or single-family homes. Unfortunately, many were built in the outskirts of metropolitan areas, often in places where most people don’t really want to reside. And even in desirable areas, the pace at which new properties were built greatly exceeded the demand to purchase the homes, causing a glut of inventory. The result was a ton of home builders going out of business or barely hanging on. And guess who wants interest rates lowered? You guessed it, the home builders. Why? So they can dump off more of their homes to unsuspecting families who think they’re getting a discount. Of course, the builders don’t actually want to lower home prices. They’d rather the government subsidize interest rates to keep their profit margins intact. As a result of many of the forces mentioned above, home prices increased rapidly. Everyone thought they could get rich in real estate, either by flipping a property or refinancing over and over and investing the money. The promise of never-ending home price appreciation hid the risk and kept the critics at bay. Even those who knew it would all end in tears were silenced because rising home prices were the absolute solution to any problem. Heck, even if you couldn’t make your monthly mortgage payments, you’d be able to sell your home for more than the purchase price. Once that reality faded, big problems emerged. What happened to all the money that was extracted from these homes? Finally, the homeowners themselves should take some accountability for what happened. After all, no one was forced to buy a home, or forced to refinance and pull hundreds of thousands of dollars out of their home. And where exactly did all this money go? When you tap your equity, you get cash backed by a home loan. But what was all that money spent on? Were these equity-rich borrowers buying brand new cars, going on fancy vacations, and buying even more real estate? The answer is YES, they were. Everyone got a little caught up in the excitement and forgot that you actually had to pay the money back. They were loans, not free money, yet many borrowers never paid the money back. They just walked away from their homes, but may have kept the many things they bought with the proceeds. You’ll never hear anyone admit that though. Ultimately, each borrower was responsible for paying their own mortgage, though there were certainly some bad players out there that may have manipulated some of these folks. Still, a home purchase is a major decision and one everyone should fully understand and be comfortable with before proceeding. And while you can blame others for financial missteps, it’s your problem at the end of the day so take it seriously. There are likely many more reasons behind the mortgage crisis, and I’ll do my best to add more as they come to mind. But this gives us something to chew on. Read more: When will the next housing crash take place? Good Article. The only thing I would add is; Loan Officers were real Loan Officers prior to 2001. The Loan Officer worked for the bank and had a degree in business/ finance or years of banking experience. In 2004, I started to notice that anyone could be a Loan Officer,- the loans were being originated in such large volume anyone could be a Loan Officer especially if you were a good sales person. The moral, ethical and trust values were lost and it was all about making money not the consumer. You for got the root cause of all this. Who allowed all those people to originate these loans? It was the Clinton and Bush administration. The government wanted more home ownership so they instructed HUD to instruct Fannie Mae to process more loans. The only way to process more loans was to lower the lending standards. Lending standards are set by Fannie Mae and they were compelled by the government to lower there standards to increase home ownership. So it was the government that actually caused the housing crisis. If they never lowered the requirements then the crisis would have never happened. Frank /Dobb, Clinton, and a liberal lowering of mortgage requirements had everything to do with banks, without scruples, to make easy money on mortgage origination. Don’t ever be fooled by anyones spin! Actually this all started under Carter. The fair housing act, but it didn’t have big enough teeth. It was pushed heavily along under Clinton. Frank and Dodd gave it teeth and shoved it through. Bush actually tried to warn this was no good, but the Dem controlled house and congress got it done. Just about anyone with a paycheck from anywhere could buy a 300k home, gee wonder whats gonna happen. Get their Dem Pres elected and blame Bush, thats what. At the expense of the american people. Blame the government BUT who was making all the money from these home loans? The builder, the mortgage broker, the appraiser, wall street, etc, not the homeowner. Nobody ever mentions that. The house price was set by the builder and they kept raising them beyond the worth of the home. SO who really got rich? Regardless of the price, the value is what one is willing to pay. I blame the home builders, who as you mentioned, created tons of fake neighborhoods throughout the country, especially in random areas where housing demand wasn’t at all strong. And they were selling homes with all types of crazy incentives like zero down with all sorts of tax credits. I don’t think they actually checked to see if anyone could actually afford the homes. For most of his career, Barney Frank was the principal advocate in Congress for using the government’s authority to force lower underwriting standards in the business of housing finance. Although he claims to have tried to reverse course as early as 2003, that was the year he made the oft-quoted remark, “I want to roll the dice a little bit more in this situation toward subsidized housing.” Rather than reversing course, he was pressing on when others were beginning to have doubts.His most successful effort was to impose what were called “affordable housing” requirements on Fannie Mae and Freddie Mac in 1992. Before that time, these two government sponsored enterprises (GSEs) had been required to buy only mortgages that institutional investors would buy–in other words, prime mortgages–but Frank and others thought these standards made it too difficult for low income borrowers to buy homes. The affordable housing law required Fannie and Freddie to meet government quotas when they bought loans from banks and other mortgage originators.At first, this quota was 30%; that is, of all the loans they bought, 30% had to be made to people at or below the median income in their communities. HUD, however, was given authority to administer these quotas, and between 1992 and 2007, the quotas were raised from 30% to 50% under Clinton in 2000 and to 55% under Bush in 2007. It’s also important to take into consideration that the homeowners themselves volunteered to purchase these homes with questionable mortgage loans. It’s no ones responsibility but your own to figure out what is best for your own personal finances. Nothing is set in stone until you sign on the dotted line and no one is forcing their hand to sign. The blame can be pointed at everyone and it seems the homeowners are the ones playing victim all to well when it was their choice and responsibility to know what in fact they were getting into. Financial institutions can offer whatever programs they want to and can definitely pressure people into certain loans. But just because you go to a car dealership and the salesman is pressuring a certain car doesn’t mean you just blindly take the first one that he says you should buy. Its being an adult and not biting off more then you can chew. Just my .02. For whatever its worth, I was working in real estate sales around 2007. Besides showing properties, I did broker price opinions. My job was to determine asking prices…. On a regular basis, I would determine the correct ask price and present my data to the broker. I consider my self a value minded guy, but I remember thinking that something was wrong With this pricing. I also did maintenance and handy man jobs on foreclosures. It was a big scam. I would give an estimate to the bank for a job, maybe I thought a lawn mow every two weeks should cost $30, im not greedy, and I like work hard and do a good job, immediately the broker corrected it and had me charge hundreds. I was making hundreds of dollars per hour using a push mower. It was ridiculous and seemed wrong. $30 to $50 per hour to shovel snow. It seemed like too much. And the banks actually paid it. How? I didnt think it was right. I kept thinking im going to loose jobs if I charge too much. It all fell apart. I was right. It doesn’t pay to charge people too much for anything, its just not moral or sustainable and poor business practice. I like a fair price because I believe what goes around comes around. Just to help keep things normal. Use it for buying and selling. It can work for real estate. E is earnings. Your earnings on a home are what you save by owning vs. Renting. Comparable annual rent for similar property-property tax-maintenance cost annually. E= 12,000-(4000+3000)=5000 so you earned 5k by not renting. And a good rule of thumb. If your looking to buy a home, and the price seems to high, compare to the risk free rate…you may be better off buying a bond and waiting ten years.. if you need a mortgage buyer beware. A value minded real estate investor might offer half and negotiate from there. I will offer any random reader another tip. If the short term is higher than the long term …wait..
Bush. The fact is that Clinton did start the mortgage market to climb and he DID deregulate the mortgage market…”A LITTLE”. But Bush took it to another much higher level. He saw what a great job Clinton did and how the market grew but Bush being Bush and having to prove himself to Daddy went hog wild and he thought well if Clinton deregulating it a little did that good then i will deregulate it even more and the market will go thru the roof,…and it did, but then it crashed. The mortgage market is supposed to move like rolling hills,…NOT HIGH PEAKS AND LOW VALLEYS. BUSH just had to prove himself to daddy in Iraq and with the economy and as usual he F***ED IT UP LIKE HE F***ED EVERYTHING UP. The difference being, Clinton listened to his advisors and he had damn good advisers!!!! Keep political opinions out of this. I’ll go with the well thought out backed up in facts of the previous comments. Well put. I agree with you 100%, Michael.p b. You said “Keep political opinions out of this” and then you went on to say “I am a Left Wing Liberal idiot”. I just wanted to point out your hypocrisy. The main reason was government granted way too many people cash and incentives to people who had no way to make long term payments and thus people who had NO business buying a property were bidding up the prices on property when they were artificial unqualified buyers ! So then no flip no payment til bankruptcy.